Nowadays the dial is a key pad, generally with 12 keys numbered 0-9, *, and # that perform an equivalent signalling function to that of a rotating disk dial. In telephony, the word dialing (in present and past tense spelt with two "l"s in British English and with one in American English) describes the process of the placement of a telephone call. From as early as 1836, there were various suggestions and inventions of dials for sending telegraph signals. After the first commercial telephone exchange was installed in 1878, the need for a telephone dial became apparent. The first telephone dial patent was jointly issued to Connolly and McTighe in 1879. There were numerous competing inventions, and 26 patents of dials, push-buttons and similar mechanisms for signalling which telephone subscriber was wanted by a caller were issued prior to 1891. Most involved highly complex, and expensive, mechanisms and required the user to perform complex manipulations. The first commercial installation of a Telephone Dial accompanied the first commercial installation of a 99 line automatic telephone exchange in La Porte, Indiana in 1892, which was based on the 1891 Strowger patent designs. The original dial designs were rather cumbersome and development continued during the 1890s and early 1900s hand in hand with the switching technology. In the 1950s, invention of plastics saw the dial itself change from metal disk to a plastic ring. The dial numbering can occur in 4 different formats, with 0 either being placed next to the 1 or the 9 and the numbers running in ascending or decending order with either the 0,1 or 9 being closest to the fingerstop. However, the number of pulses sent by the dial remained the same with one hole movement sending one pulse and 10 hole movements sending 10 pulses. All the telephones connected to a particular telephone exchange had to have the same dial numbering. Generally dial numbering was standardised on a countrywide basis, though all 4 dial formats were used. In the early 1960s Bell Telephone Laboratories researched various key pad layouts to replace the telephone dial, for electronic telephone equipment. Researchers rearranged the dial numbers in a wide range of combinations from mimicking a telephone dial to the now familiar 4 row by 3 column keypad. They found the 4x3 keypad to be the fastest and most error free arrangement to operate. 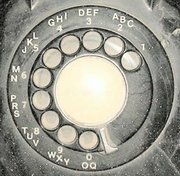 However, because the American telephone dial had the 0 next to the 9, they tested the arrangement with a 1 at the top and 0 at the bottom, below the 8 key. They also tested an arrangement with the 0 below the 2 and having 9 at the top, as appeared on adding machines at that time and now appears on computer and calculator keyboards, but that arrangement was more error prone as few people were familiar with adding machines at that time. Because of this research, phone key pad numbering is reversed to today's calculator and computer keyboards. Using your cellphone just for talking is so 20th-century. New technology now lets you turn your phone into your best asset for weight loss and fitness. You'd scope out a mechanic before letting him work on your ride. Why do any less for your bod? Here's what you need to know when looking for a new doctor. BellSouth provides free dial-up Internet usage for customers affected by recent hurricanes.